Wondering how and when a rough, eight-game losing stretch would end, the Milwaukee Brewers finally put a whole game together to defeat the Cincinnati Reds, 4-2, ending the skid and avoiding a four-game sweep. Kyle Lohse (1-3) lasted seven innings while striking out four to pick up his first win in four starts this season. He allowed two runs on three hits. Lohse did falter in the fifth inning trying to protect a 1-0 lead. The righthander served up a two-run homer to Marlon Byrd, handing the Reds a one run advantage. It didn’t last long, though, as Aramis Ramirez answered with his first home run of the year, a solo blast to even the game at two. 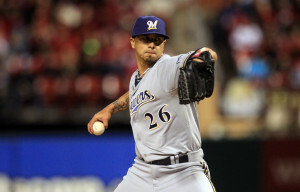 Then in the seventh, Milwaukee (3-13) took advantage of a leadoff walk to Logan Schafer as Jean Segura connected on a two-out RBI single to center to give the Brewers the lead for good. In all, the Brewers posted ten hits, led by Adam Lind’s 3-for-4 effort that included a solo home run in the second inning to start the scoring. Ryan Braun added two hits and a run scored when he took advantage of an Reds defensive error on a steal attempt at third to add an insurance run in the the eighth. Milwaukee’s bullpen helped close out the third win of the season, tossing scoreless frames in the eighth and ninth. Jonathan Broxton struck out the side in relief of Lohse before giving way to Francisco Rodriguez, who earned his second save on the season and 350th of his career. The homestand continues with a weekend series against Central Division-leading St. Louis Cardinals (10-4). It begins Friday night with Matt Garza (1-2) getting the starting call against Carlos Martinez (1-0). First pitch at 7:10pm.